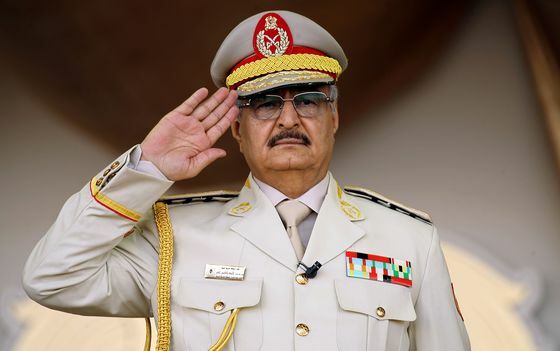 (Bloomberg) -- Libyan strongman Khalifa Haftar’s forces advanced to the outskirts of Tripoli, setting up a potential endgame for the capital as the country’s UN-backed government vowed stiff resistance. Under attack from fighter jets, Haftar’s self-styled Libyan National Army fought its way toward the country’s most populous city, where battle-hardened militias that oppose him have mobilized. Appeals for calm by global powers showed no sign of halting Haftar’s four-day offensive. The U.S. and European governments are voicing alarm at the escalation, which has the potential to rattle oil markets and drag the OPEC member country into a civil war. Group of Seven foreign ministers expressed “deepest concern” in a joint statement on Saturday after a meeting in Dinard, France. Eastern-based Haftar, whose forces swept through Libya’s south in January, ordered his troops on Wednesday to march on the capital. The United Nations Security Council called on Haftar’s forces to “halt all military movements,” German Ambassador Christoph Heusgen, the council president, said after a meeting on Friday. Tripoli and neighboring Misrata are home to heavily armed militias that strongly oppose Haftar. The offensive’s timing, as UN Secretary General Antonio Guterres was in Libya to prepare for an April 14 political conference, shocked even Haftar’s foreign backers, which include France and the United Arab Emirates. Haftar and Sarraj had been negotiating for weeks for a unity government ahead of elections that were to be decided during the April 14 conference. Haftar had been expected to launch a show of force ahead of the talks, diplomats said, but not launch an all out assault on Tripoli. French Foreign Minister Jean-Yves Le Drian said Haftar should halt his advance. “There is no military victory,” he said at the end of a G-7 meeting on Saturday. Haftar has shown no sign of backing down. His spokesman, Ahmed al-Mismari, said Friday the offensive would end only when Tripoli was taken. LNA forces came under four air strikes and incurred no losses, Mismari said. He said Haftar had issued orders against using the LNA’s fleet of old Russian jets in the battle, but threatened to target bases of the Tripoli government’s jets that carried out the strikes. Haftar’s forces had said they’d be welcomed in Tripoli, but Sarraj has mobilized his troops and powerful militias in Misrata have sent reinforcements to the capital. An anti-Haftar militia in Zawiya attacked LNA troops and took dozens of prisoners, according to Libyan media that aired video of the captured soldiers.